Protecting our natural resources is a critical part of a successful timber harvest. Studies have shown that timber harvesting is not a major cause of water quality problems. However, the forest truck roads, skid trails, and landings used to remove trees from the forest are vulnerable to erosion. Erosion can damage or destroy these access systems making it more expensive or impossible to use them in the future. Sedimentation—caused when the eroded soil finds its way into a stream, wetland, pond, or lake—can damage fish and other wildlife habitat as well as drinking water supplies. These problems can trigger a negative reaction from neighbors and the general public, and they may violate state or local water protection laws. They’ve also led to local timber harvesting ordinances. A good way to avoid controversies and restrictions on timber harvesting is to use Best Management Practices (BMPs). Protect water quality by minimizing erosion and surface water run-off. Maintain hydrologic processes by limiting disturbances to water flow patterns. Maintain water temperature along shorelines and streambanks. Protect nutrient balances in the soil. Ultimately, BMPs help keep forests healthy and maintain public support for timber harvesters and forest management. This field guide is a practical tool for loggers, foresters, woodlot owners, and others involved in harvest operations. It provides a menu of options to give professionals the flexibility they need to make decisions in the field. BMPs aren’t just something you do at the end of a job. They’re a mindset, an approach to the whole timber harvesting process that respects the land. That’s why this guide is organized by time, with different BMPs to consider before, during, and after the harvest. 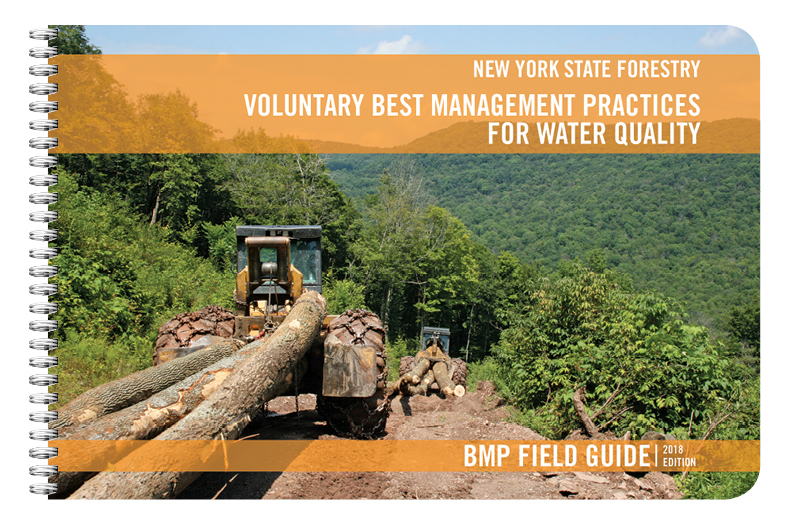 The BMPs in this guide are compliant with Section 319 of the 1987 Amendment to the Clean Water Act as well as the EPA-approved New York State Nonpoint Source Pollution Management Plan. That plan outlines a voluntary, education, and promotion-based approach to implementing BMPs. This field guide focuses on water quality. BMP manuals from other States may include guidelines to protect other forest values such as visual quality and wildlife habitat. These values are also important, but they are not the focus of this guide. This field guide has not been designed to provide a required standard for use in enforcement. It is not a regulatory handbook. It does not present a single prescription that can or should be applied in all cases. The ultimate objective is to have a safe, economically viable timber harvest that protects water quality. If you have any comments on the guide please email info@nysbmpguidelines.com.